Van Vleck ISD will be closed on Friday, August 25, 2017. All extra-curricular activities tomorrow and this weekend are cancelled. This decision was made after conferring with state and local officials. Governor Abbott has designated Matagorda County a disaster county in preparation for TS Harvey to make landfall. Information from the National Weather Service indicates Harvey will be a Category 1 Hurricane by the time it makes landfall. We have made this decision based upon an abundance of caution and necessary concern for the safety of our students, parents, and staff members. A decision on Monday’s first day of school will be made on Sunday, August 27th. 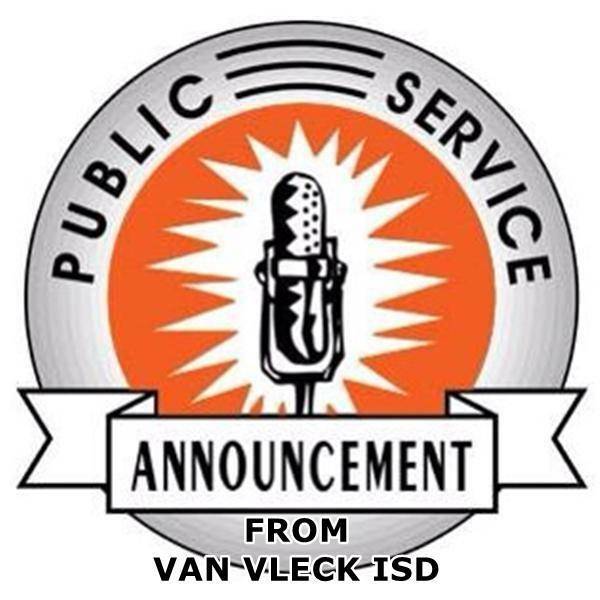 Van Vleck ISD will immediately release this PSA on the school website, social media, and the School Messenger phone alert system.